Sign Up for my newsletter and updates! I want to wish you all a wonderful and happy Thanksgiving! I hope you get to spend these days with family and friends and a day to cherish all the blessings in your life. I know that it can be so easy to tink on all the bad and chaos in the world that we neglect to see the light around us. So I ask what are you thankful for? What are the blessings in your life? I hope that you can continue to be reminded of these things as the days go by and that we all can have thankful hearts. I am very thankful that my brother and his fiance will be coming for Thanksgiving and that we will get to go to my grandparents for another year of celebration. I am so lucky I have a close family and we can gather around and eat some delicious turkey! I am also very thankful to all you readers and supporters. I have been wanting to make a blog for many years now and I have always wanted to become a working artist and through this fall I have begun to take those steps and will continue through the new year. 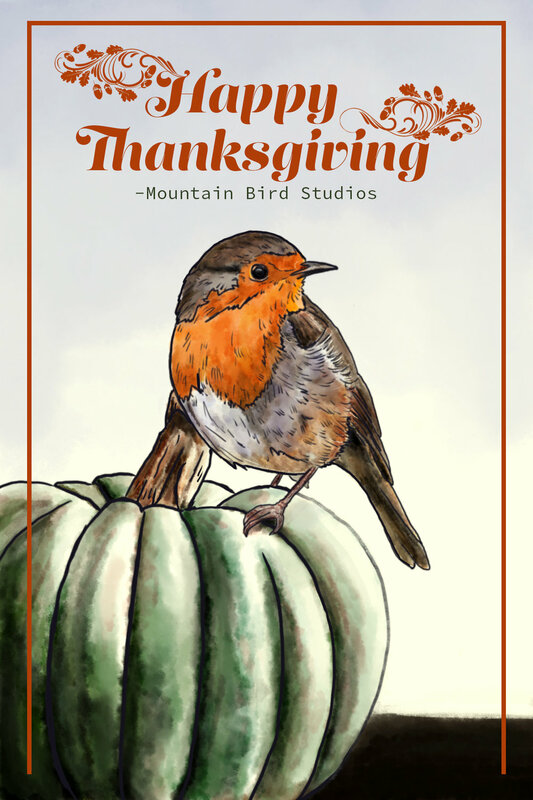 So have a happy thanksgiving and I will be back next week with my Scotland post!